Warning: There may be spoilers! The moment I knew that it was all just a big fantasy was when I realised that a bunch of guys could earn tons of money just by sleeping all day long. Perhaps only director-writer Christopher Nolan (The Dark Knight) could make such a snooze-worthy premise become a hugely entertaining movie. Inception is a sci-fi thriller about a bunch of people who possess the technology to infiltrate a person's mind when he or she is fast asleep and dreaming. At first glance, you wanted to pity the inventor of such a device because what practical use could anyone have with it except to check out another person's weird, wet and wild dreams? Apparently, these "extractors", led by expert extractor Dom Cobb (Leonardo DiCaprio, The Departed) found a lucrative use for such a device, that is of "stealing" ideas or secrets through a person's dream; for example, industrial secrets from a rival corporate head. Sort of like mind-reading, but more visceral. Japanese businessman Saito (Ken Watanabe, Batman Begins) requires such talents, but a simple mind heist just would not do for this entrepreneur. Instead, Saito wants Cobb to do an "inception", a rarely successful process of implanting an idea into somebody's grey cells. The target is his business competitor's son, Robert Fischer, Jr. (Cillian Murphy, Batman Begins), the newly appointed successor to his father's throne. Naturally, things never, ever go as expected, especially when Cobb's personal nightmares start to literally appear to sabotage his plans. 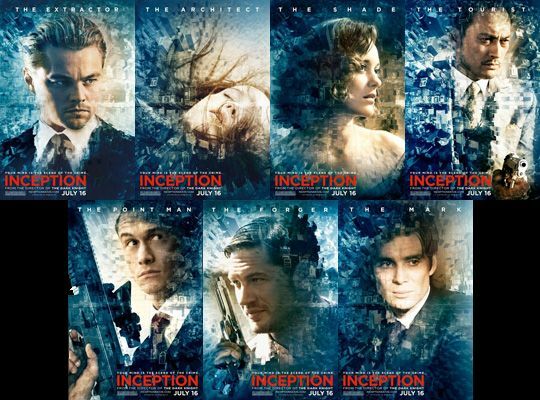 Inception shares some similarities to movies like A Nightmare on Elm Street, The Cell, and Dreamscape, where a certain individual or individuals are given the ability to invade a person's mind and occupy it like it's another world or dimension, scientifically or supernaturally. Nolan's take is a little more "grounded", so to speak, as his dreamworlds are a little more realistic and bounded by the laws of physics (for most of the time at the least). The excuse is that the Extractors are like conmen who must trick their target into believing that he is still in the real world in order to achieve their objective, so they must "build" a dreamworld that resembles reality, at least for their target. Thus, people in the Inception dreamworld still has to get into fisticuffs and gunfights and leap away from explosions, although that last one may just be more at home in that kind of place. Some people were disappointed because Nolan did not go all out and make his heroes drop entire buildings onto bad guys by just willing it with their minds. It would be fun if Cobb and co. could actually will people into bunnies or toasters. I think Nolan was not trying to portray dreams authentically, but to establish a new mythology based on dreams, with its own set of rules and conditions. For example, the concept of "projections", deaths within dreams, dreams within dreams, and the passage of time in the dreamworld. Despite all the thinking exercises, Inception plays just like a heist thriller not unlike Ocean's Eleven or The Italian Job. The heist bit brings a lot of action and excitement, while the subplot of Cobb's troubling secret keeps the tension up, emotions high, and the mystery intriguing. The movie is also well-supported by a crew of revered acting talents that include Academy Award nominees Watanabe, DiCaprio, Pete Postlethwaite (Clash of the Titans), Tom Berenger (Training Day) and Ellen Page (Juno), winner Marion Cotillard (Public Enemies), Murphy, Joseph Gordon-Levitt ((500) Days of Summer) and future Mad Max, Tom Hardy (Bronson, Star Trek: Nemesis). P.S. Seems like a lot of people were pretty vocal about how they disliked certain things, e.g. the ambiguous ending, the lack of fantastical sceneries a la The Cell, or how it could have been more "brilliant" even after they proclaimed it as just that only a few sentences earlier. Frankly, with something as rarely clever and as entertaining as Inception, any complaint would seem like severe and uncalled-for nitpicking. But since everyone's doing it, I would like to join in the fun and submit one of my own pick of the nit. Well, one thing that still annoys me now is the question of how an Extractor could actually "steal" ideas or secret from inside someone's dream. Let's say, if you want to steal a new car design from the mind of an engineer. After finding the "safe" in the engineer's mind, and taking the "secret", usually represented by a document folder in this movie, what next? It's not like when you wake up, the document would magically materialise in your hand, right? If not, does that mean that you would have to memorise the document somehow? That may be difficult if the secret you're stealing is a bunch of engineering schematics and you have close to zero understanding about automobile engineering. In the opening sequence, Cobb stole Saito's "secret" represented by a bunch of papers with the word "CONFIDENTIAL" stamped across every page, and he was actually reading it while on the run from Saito's "projections". Was he looking for something specific, or memorising the entire stack? I'm not sure if they were double-sided, but there are at least ten minute's worth of reading material there judging from the density of text even on one side of each sheet (and that's not even counting the time you may need to memorise it! ), and Cobb went through it in a second. Maybe the documents are "saved" in Cobb's subconscious, where it can only be "read" again by entering Cobb's dreams, presumably by whomever that hired him to steal the docs in the first place. I doubt anyone would pay loads of cash to an Extractor just to hear them say that, "Yup, your competitor's definitely going with the red one."